Composer Aleksei Rybnikov has always boasted non-conventional thinking and original approach: he is the author of the first Soviet rock-operas, the first rock-n-roll broadcast on the national radio, and a variety of ingenious novelties in composition and sound recording. In the course of his long and prolific career he has composed music for over a hundred well-known Russian feature films. Alexei L’vovich Rybnikov was born on July 17, 1945, in Moscow. Unique musical gift of Alexei revealed itself at an early age: when an eight-year old boy he already became the author of several piano plays and music for the film Baghdad Thief. At 11 he composed music for the ballet Kot v Sapogah (Puss in Boots). A great role in moulding the future composer’s outlook belonged to his teacher Aram Ilyich Khachaturyan. When introduced to Khachaturyan by Alexei’s father, a violinist, the boy demonstrated his music to the adult composer, and this in many ways determined the future of Rybnikov. Aleksei RybnikovFrom 1956 to 1962 Alexei studied at the Central Music School for Gifted Children. In 1962 he entered the Tchaikovsky Moscow Conservatoire, where he studied at Khachaturyan’s composition class, and graduated it with honours in 1967. After that he took post-graduate course in 1969. At 18 Rybnikov already had his own family. In order to provide for it he had to combine his conservatoire studies and creative activity with giving private music lessons, working as a concertmaster at a theatre institute and even as an accompanist in a kindergarten. From 1969 to 1975 Alexei Rybnikov taught at the chair of composition in the Moscow Conservatoire. The composer made his official debut with performing his piano sonata Khorovody (Round Dances) composed at the first course of Conservatoire studies. The composition aroused interest in music circles. Aleksei Rybnikov After graduation Rybnikov, along with instrumental composition, turned to other genres. He composed romances Molitva (Prayer) and Telephone to the lyrics by L. Ashkenazi. The records of his soundtrack for the film Big Space Travel (1973) were sold in great numbers, over a hundred thousand copies. The release of soundtrack for the children’s film Priklyuchenia Buratino (Adventures of Buratino) (1975) exceeded a million records. Rybnikov also composed music for stage plays Kovarstvo i Lyubov’ (Treachery and Love), Prozrachny malchik (Transparent Boy), and Skazka o Chetyrekh Blizhetsakh (A Tale of Four Twins). The Star and Death of Joaquin Murrieta The composer gained recognition and fame mostly due to his works for music theatre. The year 1976 saw the premiere of the rock opera Zvezda i smert' Khoakina Murety (The Star and Death of Joaquin Murrieta) in Lenkom Theatre. It was the first rock opera in the Soviet Union, and a kind of revolution in the theatre. The production went with a bang making both the play and the music very popular. Juno and Avos Though getting a lot of tempting offers Rybnikov chose the freedom of creation by starting work on his new modern opera Yunona and Avos (Juno and Avos) (based on Voznesensky’s poem) which combined the traditions of Russian Orthodox prayer with English art rock. Its premiere took place in 1981 in Lenkom Theatre. In 1982 the Ministry of Culture of the USSR banned the release of the album Yunona and Avos. Rybnikov applied to court and won the case. Later the rock opera started touring around the world. The play has been performed for over 20 years and still remains a sell-out show. In 1988 Alexei Rybnikov founded the production and creative association “Sovremennaya Opera” (Modern Opera). In 1992 the theatre came out with the premiere of Rybnikov’s mystery musical Liturgia Oglashennykh (The Liturgy of the Catechumens) that was performed there for 70 times within two seasons. In the late 1994 – early 1995 the Modern Opera Theatre toured in the USA. The Liturgy of the Catechumens won public acclaim. In 1996 the opera was performed in “The Spectacle and Sound Space of Alexei Rybnikov”, a theatre created according to Rybnikov’s design. In 1999 Alexei Rybnikov’s Theatre was open. Along with theatre work Rybnikov proceeded in instrumental composition. In 1998 he created the ballet Vechnye Tantsy Lyubvi (Eternal Dances of Love). 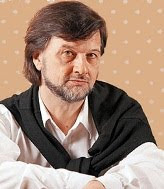 Aleksei Rybnikov In 2000 Rybnikov’s new musical drama Maestro Massimo premiered in the State House of Radio Broadcasting and Sound Recording. In 2001 Alexei Rybnikov restored the lost score of the ballet Baldur's Dreams by the Norwegian composer Geirr Tveitt after Scandinavian epos. Its premiere took place at the festival in Bergen (Norway) in 2002. The same year saw the premiere of the television film Deti is bezdny (Children from the Abyss) directed by Pavel Chukhrai and produced by Steven Spielberg, with the soundtrack by Alexei Rybnikov. The film is dedicated to the hard lot of Jewish children dwelling on the territory of the Soviet Union during World War II. Alexei Rybnikov lives and works in Moscow. Apart from music, his major passion, the composer is keen on traveling. The music to the movie "The Tale About Star-Child" (final) by Oscar Wilde stories.